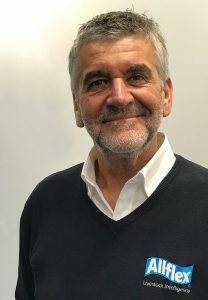 Allflex, part of the Antelliq group of companies, has appointed Pete Hansford to the newly created post of product group manager for its range of livestock identification products. Mr Hansford will oversee the company’s range of livestock identification products which includes tissue sampling tags and electronic identification (EiD) tags, as well as own-brand and Agrident tag readers and Gallagher weighing equipment. He will be based at Allflex’s UK headquarters in County Durham. Mr Hansford joins Allflex from Betafence UK, where he headed the company’s agriculture division manufacturing a range of cattle, sheep and deer fencing. His earlier experience includes area sales manager for livestock handling equipment company IAE. “With DEFRA looking to make EiD in livestock compulsory by as soon as 2020, Allflex is committed to providing cattle producers with the necessary help and advice to ensure they fully understand the implications of the proposed regulations and to help them conform to the new rules in the most cost-effective way,” says Mr Hansford.